while Trey (2 years) is a great eater, wouldn’t it be cool if he was eating even more fruits and veggies?! Well, it dawned on me that why not “hide” it into our normal foods. Kind of like my Mr. Grinch Smoothie and Black Bean Brownies. Anyhow, the other month I was making sloppy joes and had opened a can of organic sweet potato puree for Charlee. As I stirred my cooking meat I thought…..”why not?” So I scooped about 1/2C into the sloppy joe meat and viola, “dinner’s ready boys!” 😉 I waited till J’s and Trey’s servings were half gone to let them know of my new recipe….I don’t think either heard me has they continued to clean their plates! Success! A few days later I pureed cauliflower and added it to Trey’s, Annies Organic Mac & Cheese. Another success! A great resource for more ideas is Deceptively Delicious. 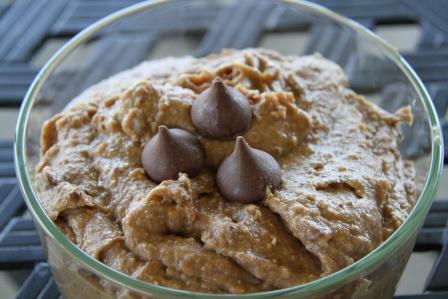 Making baby food is simple and affordable! Awhile back I was fortunate enough to receive a Baby Breeza to test and blog about. With Charlee (7months) now at the age to eat solids it has become a countertop staple. It is so incredibly easy to throw whatever produce I am prepping for the week into the Baby Breeza and have baby food ready in no time. The all-in-one steam and blend feature allows for less mess which us moms can agree is a bonus! However, the best feature is you can set the “steam/blend” mode and walk away, go change a diaper, put a kid down for a nap, or go finish your game of Candyland. I’m a big fan and so is Charlee! So far we have made broccoli, potatoes, cauliflower, sweet potatos…all organic. Here is my baby food post from Trey. 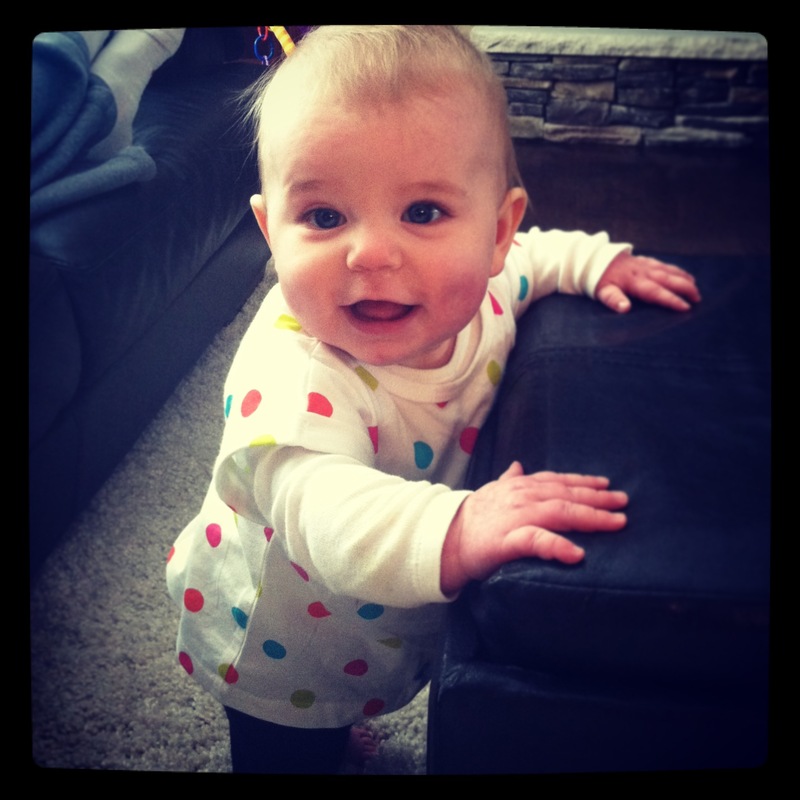 Just last month a new study came out about starting solids. ” Currently, the AAP recommends waiting until 6 months. Until that time, the AAP recommends breast milk as the sole food for infants (along with necessarily vitamin supplements).” Check out the Huffington Post article here. 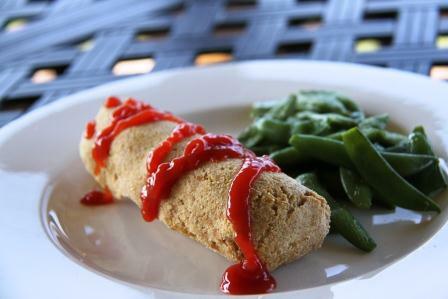 In honor of the Iowa State Fair today’s recipe is for CORN DOGS! You heard me right! 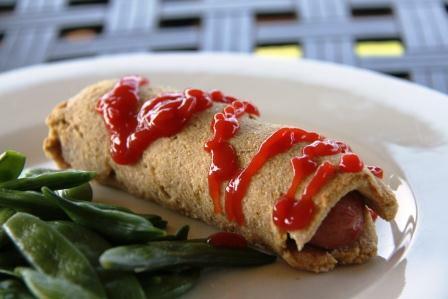 However, instead of the fried dough and not so natural hot dogs, this recipe offers all the goodness your kids…and maybe you love 🙂 and none of the icky. In a large bowl, whisk cornmeal, 1 1/2 C flour, sugar, baking powder, baking soda, onion powder and cayenne With the large holes of a box grater, shred the butter over the top of the flour mixture, stopping 2 or 3 times to toss flour over butter to prevent clumping. Stir until combined, breaking up any large clumps. Add buttermilk and stir until just moistened. Turn dough onto lightly floured surface and knead briefly with floured hands just until dough forms a ball. Divide into 2 equal pieces and press each into a thick disk. Wrap each loosely in plastic wrap or parchment paper and freeze for 10 minutes. Do no freeze for more than 10 minutes. Preheat oven to 400F. Meanwhile, pat the hotdogs dry with paper towels and stick a skewer 2 to 3 inches into 1 end of the dog. On a large plate add remaining flour. In a wide, shallow bowl lightly beat egg whites. Remove 1 dough disk from freezer and transfer to floured surface. Roll into a 13 inch wide and 1/4 inch thick oval. Cut into 4- 3 1/4 inch wide strips that are about 2 inches longer than the hot dog. Dip 1 hot dog in flour, shaking off excess, then dip in egg whites. Transfer to 1 dough strip and wrap with dough, gently pushing seams together to seal. Pinch off excess dough from ends to completely cover tip, leaving a 1/4 inch of hot dog exposed at skewer end. Transfer to a greased pan. Repeat with the remaining dogs and dough. Bake until bottoms are golden brown and dough is cooked through, about 15 minutes. Obviously, this recipe takes a little more time and love so save for a special occasion…like fair week! You got it! Another deceptive yet nutritious and delicious dessert for you to whip up for your family tonight! Similar to my black bean brownies, this recipe uses beans as its creamy base. In a bowl, cover the dates with 1/2 cup water. Let this sit for several hours (the original recipe says 8 but you can get away with 2-3). Add all ingredients (including the date water), except chocolate chips, to a blender or food processor and blend until smooth. Refrigerate for 20-30 minutes and then stir in chocolate chips. Serve as a dessert dip (with apple slices, animal crackers, etc) or pudding, mix into oatmeal, stuff into cupcakes or top pancakes with it. Remember it is a dessert so don’t eat all the batter at once 🙂 The taste is similiar to a cough flavored Larabar! Most parents realize that overloading on candy is not the best option for their children, but often feel trapped by the notion that Halloween revolves around delicious, sweet confections. Of course, adults are not immune to Halloween snacking either. These tips will help you prepare you and your child for a ghoulishly fun Halloween evening and week after, without the ghastly sugar highs and upset stomachs! First, make costume design a part of the holiday. Rather than buying a costume out of a bag, spend the day or part of it brainstorming costumes with your child and then making it! Or if you do not have much time, have your child design an accessory for a prebought costume—Spiderman needs his webs! After getting into the costume, initially choose an alternate event to trick-or-treating, such as going to a haunted houses, pumpkin picking/carving, and hayrides. Contact a local pumpkin patch or haunted house to see when they hold events. 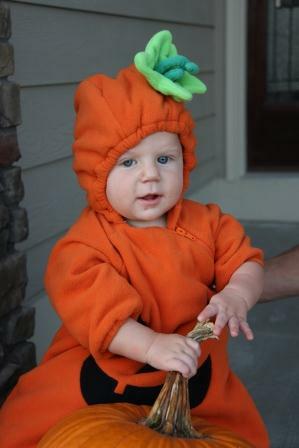 Children will have a ton of fun, especially while dressed in their favorite costume! Then if your kids still have some energy left, a little trick-or-treating provides a nice way to conclude your day. Once your kids or teens return home from trick-or-treating, allow them to choose a set amount of candy, three to five fun/mini-sized pieces for example. Let them pick which ones they want. Also, as silly as this sounds, unless your children offer you some candy, do not eat their candy! Then, allow them to select any two remaining pieces of candy every day until the stash is gone. Ask them which pieces they chose and why, so you learn which ones they prefer, or better yet, sit with them as they choose and watch their decision-making process. It may amaze you to learn about how much or little a child thinks about candy. If you choose to offer snacks to trick-or-treaters, choose options that provide at least a little nutritional value. Compared to most other candies, dark chocolates, such as Hershey’s® Dark Chocolate Kisses® or Special Dark Miniatures, have a bit less sugar, plus some fiber, protein, and antioxidants. Mini packages of popcorn, baked chips, pretzels, or Fig Newtons® provide some nutrients from the corn, potato, grains, or figs. If you give candy, give the mini-sized pieces rather than the fun-sized ones, which usually are at least twice the size and calories. This allows children to choose multiple candies for the same number of calories. Try to avoid giving any snacks that are pure sugar. Look at the nutrient label and if the only calories come from carbohydrates and sugar (no fat or protein), then it is a safe bet that it is all sugar. Another alternative to all of these snacks are mini packs of gum, which tend to have fewer calories and are enjoyable for almost any kid! For even less sugar and fewer calories, consider giving out sugar-free gum. If you do not want to give out candy or gum, researchers have found that children 3−14 years of age were just as likely to choose a small toy instead of candy. Think about passing out bouncy balls or temporary Halloween tattoos instead of candy. Visit your local party favor or discount store for even more ideas. 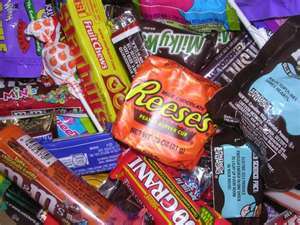 Get rid of leftover candy and chips that you did not hand out as soon as possible. Take the extras into work, donate them to a shelter, or throw them out. This way you and your children do not have devilishly unhealthy snack options staring you in the face. The sooner you return to normal habits, the sooner you can prepare for the next major holiday, Thanksgiving, which of course also revolves around food. seriously Mom, what am I wearing! How do you manage the trick or treats in your house? I’ve heard about a local dentist office who will swap your candy for $$ and a Halloween Fairy who trades the candy for a toy! Please share your ideas in the comments! Well as I look at my desk I see piles of newspaper and magazine clippings waiting to be shared to YOU, my blog readers. So this article has “MOMS WITH PICKY EATERS” written on the top. I found it in the newest addition to my magazine collection…Parenting Magazine. Other great ideas are mixing in tuna, broccoli, or peas to your mac & cheese! 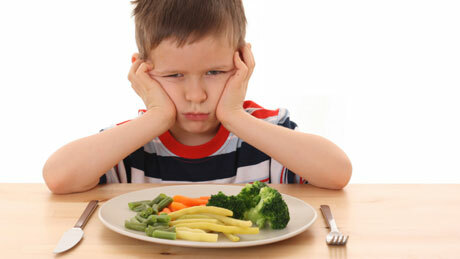 Do you have any clever ideas to getting your kids to eat fruits and veggies? Please share! Announcement: The month of October is FREE at Crossfit Des Moines. Now is your chance to check out the gym and see what the buzz is all about!